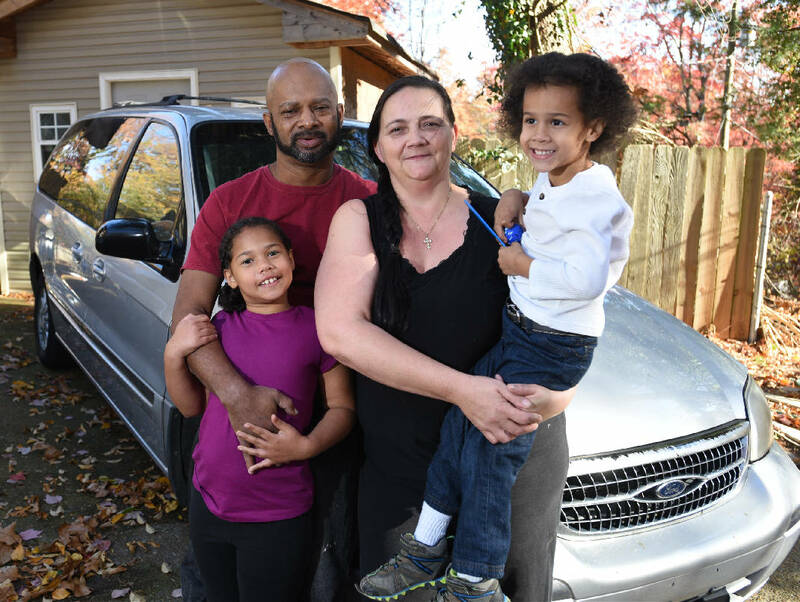 Bradley and Shannon Taylor stand with kids Elizabeth, standing, and Aiden stand Wednesday, Nov. 23, 2016 with their van. Less than two years ago, Bradley Taylor and his family were homeless, living in a tent. Now they have a two-story, three-bath, four-bedroom home in Hixson. But money is tight. When he faced a $3,300 repair bill for his van, he was in a tight spot. Taylor needed the van to transport his two special-needs children. Just when he thought he was going to lose the vehicle, the veterans at VFW Post 4848 on Amnicola Highway told him to call Southeast Tennessee Veterans Coalition caseworker Mickey McCamish, a retired Navy captain. McCamish worked with at least four other agencies collecting funds. And he told Taylor about the Neediest Cases Fund, where he got the last $600 he needed to pay for the van repair. "It was nothing short of a blessing," said Taylor, who served three years in the Air Force as a C-130 engine specialist mechanic. The U.S. Air Force veteran is among 170 people and families helped this year by reader contributions to the Neediest Cases Fund, which was founded in 1914 by Chattanooga Times publisher Adolph Ochs. Stories highlighting the needs of local people will run in the Chattanooga Times Free Press twice a week until the end of December. Donations from readers will be administered through the United Way of Greater Chattanooga. McCamish said the Neediest Cases Fund brings stability and removes barriers that prevent people from becoming productive in the community. "He's got a van and he's got transportation to a job and that's a result of the Neediest Cases Fund," McCamish said. "It would not happen without the Neediest Cases to help people in tough situations." Taylor said he got a job at Amazon since getting his van repaired and plans to attend school to become an insurance salesman. Taylor's 2000 Ford Windstar was transportation for the whole family. When it broke down, he had to pay for rides to the pharmacy and the grocery store. Any extra money he had was eaten up just getting around town. Mechanics at the Hixson Goodyear on Highway 153 replaced his exploded battery and installed new brakes, a new radiator and a water pump. He put the van in the shop in May and couldn't afford to get it out until August. Some places start charging storage after 10 days, and a car left longer than 30 days could be considered abandoned if the owner makes no contact with the shop, store manager Amy Perry said. Instead, Perry said, she worked with Taylor until he raised money to pay his bill. Taylor came here with his wife from Ohio three years ago trying to move closer to his children in Atlanta. For awhile, he lived with his wife and two children in a tent at Booker T. Washington State Park and in the Maclellan Shelter for Families. Then he got the home of his dreams through a HUD Veterans Affairs Supportive Housing voucher, along with the van. He's impressed by and grateful for people who've reached out to help him, because almost no one in Chattanooga knows him. "It's amazing to get any help at all," said Taylor. "But so many people pitched in to help me, it was mind-blowing."